Wargaming.net has unveiled a brand-new website for World of Warplanes, a "flight combat MMO action game set in the Golden Age of military aviation." Say "MMO" in a crowded room and most people will instantly envision the relatively recent phenomenon of games like World of Warcraft or Lord of the Rings Online, but those of a certain vintage and upbringing [usually identifiable by their gnarled right fists and dangerously-focused look in their eyes] will flash back to something else: yanking and banking warbirds in huge, endless furballs amidst the digital clouds. Those decades-old MMO progenitors were primitive and expensive, and they were glorious. And soon those grizzled joystick jockeys [and new meat, too] will be able to take to those murderous skies once again in World of Warplanes, an upcoming MMO that puts players in the cockpits of classic fighters of the mid-20th century. From the close of the biplane era to the early combat jets of the Korean war, World of Warplanes will support variable ammo types, engines and other components in nimble light fighters, hard-hitting heavy fighters and lumbering, tough ground attack planes. Whether this will be a serious flight sim or an arcade-style turn-and-burner hasn't been revealed but Wargaming.net does have pretty solid cred in the historical combat MMO genre. World of Tanks, an armored combat game set in the same era, features more than 90 accurately-rendered armored vehicles from the same era and earlier this year set a new record for concurrent users on a single server with nearly 75,000 digital tankers slugging it out on the battlefield. There's not much to see at this point beyond a dozen screens of WW2-era fighters in action but the official World of Warplanes website is now live at www.worldofwarplanes.com. 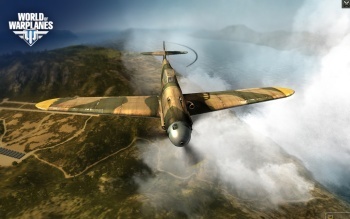 World of Warplanes is currently expected to lift off sometime in 2012.